The zPen Digital Pen is a revolutionary new natural input device that captures your handwriting without the need for special paper or a direct connection to a computer. Write notes anywhere and then upload the files to your computer any time. It's the perfect merger of our most natural form of creative expression, pen on paper, with the modern need to digitize everything. Who is the zPen for? The zPen is ideal for professionals, middle managers and students. Middle managers sit in a lot of meetings. They end up with hundreds of pages of notes in the classic yellow tablets. Buried in those tablets are to-do items, schedules, diagrams, agreements; lots of important stuff. But it gets lost there. Now there is a way to save, edit, search, and send these vital notes without spending hours typing. The zPen effectively replaces the laptop computer and its disruption in meetings. Some companies have begun prohibiting laptops in meetings because the user becomes a passive recorder and is no longer an active participant. 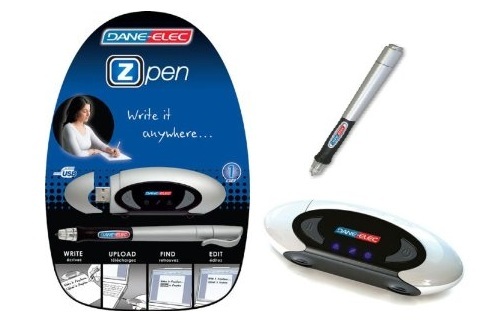 The interface with the zPen, however is completely intuitive, so all your creative faculties remain in play. It actually liberates the creative juices. This is especially true in the classroom. Professors are complaining about looking out at a sea of screens and wondering if anyone is listening, much less participating. The zPen captures those notes, formulas and diagrams intuitively and without distraction. The zPen is remarkably easy to use. Pull out your familiar pad of paper and your zPen receiver. Clip it to your pad and turn it on. Start to write with your zPen. That’s it. 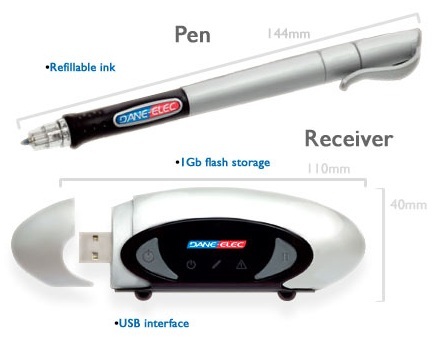 The Pen automatically turns itself on and off. It may be the most unobtrusive technology available. You’re at your creative best with all your attention on the task at hand. It will run all day and store thousands of pages. Whenever you return from your meeting or class, simply insert the receiver into your USB port. The Viewer software automatically opens from the receiver and you click on the newest file to see your work. The accuracy and thoroughness of the zPen will delight you. Giggles are a common reaction to seeing all your creative glory on the computer screen for the first time. From there, you have numerous options.